MetalForming came of age at the age of 21. 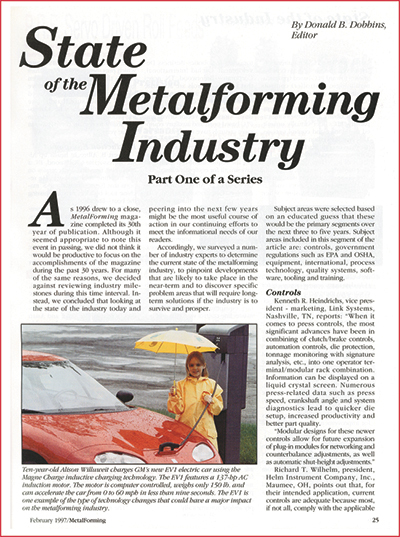 That’s when, with the June 1988 issue of Metal Stamping magazine, the Precision Metalforming Association changed the publication’s name to MetalForming. This was “in response to the changes in the metalforming industry,” wrote PMA president Jon Jenson, who at that time also served as the magazine’s editor. “The industry has begun to blend various types of operations, and technologies that were traditionally separate are being merged,” Jenson wrote. 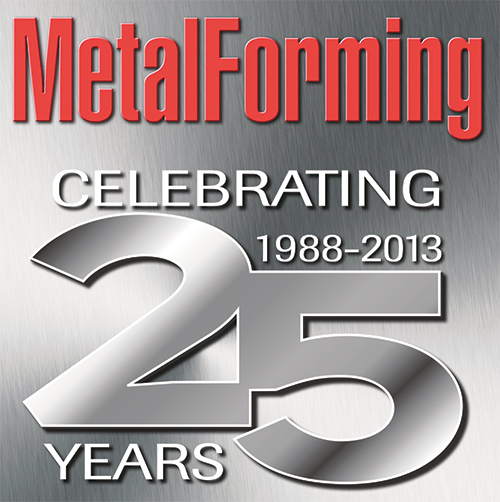 This year we mark 25 years as MetalForming magazine, yet our story begins actually just a couple of months before our official name change. For years this magazine covered closely the debate surrounding the use of presence-sensing device initiation (PSDI) in pressrooms, and finally, in March 1988, OSHA issued the long-awaited regulation authorizing the use of such devices to initiate stroking action on manually fed mechanical power presses. An article in our May 1988 issue described the 3-yr. review process to overturn the original regulation prohibiting PSDI, published in 1971. Also trending in the late 1980s was diversification as a strategy leaned on by metalformers to protect against economic swings. “As with any investment portfolio, diversification is the best to protect against economic swings that could negatively impact any single segment of the business.” That’s what ne Groenstein, chairman of Interlake Stamping, wrote when we asked him to consider strategies that metalformers have followed to remain competitive. Automation came of age in this decade, and the changing automotive scene as well as shifting market forces brought angst and opportunity. After a shaky start, the U.S. economy roared through the 1990s, with metalformers reaping rewards in some market sectors and adjusting to major shifts in others. On top of that, a whole new world was opening up, bringing new global markets and fierce worldwide competition. Though extremely successful from a general business point of view, the decade saw the American economy accelerate its orientation from manufacturing-based to service-based. That meant consolidation among metalforming companies and along the whole manufacturing supply chain. Passage of the North American Free Trade Agreement opened up Mexico as a prime part-supply and assembly option. The magazine came of age with the June 1988 issue. Our new name and identity came in response to changes in the metalforming industry, which had begun to blend various types of operations and technologies that traditionally were separate. Our article, “Observations on Automotive Stamping Developments,” from the April 1990 issue of MetalForming, benchmarked automotive stamping plants in Japan and stamping operations of Japanese automotive companies located in the United States. Here we reported on how the Big Three stamping operations fared. The results were not pretty. Big Three stampers lagged in areas such as die-change time, and were at a significant disadvantage in percentage of uptime, operations required to produce each part, die cost and press throughput. The era also offered opportunities for U.S. suppliers to contract with new automotive OEM transplants. A survey at the time showed that 85 percent of these companies were seeking involvement of U.S. suppliers, and expected to significantly increase the number of U.S.-supplied components. Deemed critical to good relationships between domestic stampers and transplant companies: quality and price. Pressroom technology continued its inexorable trek forward throughout the 1990s, with automation coming of age to help the industry better cope with competition worldwide. MetalForming in the 1990s detailed advances in robotics, part-transfer systems, presses, die-sensor technology, controls and in-die value-added capabilities. We also tackled a host of other metalforming and value-added processes as the industry outfitted itself to do more and more for its customers. In our February 1997 issue, for example, we described the then-current state of pressroom technology, markets and management, but also noted that success boils down to the quality of workers. “Looking at the industry as a whole, a barrier to utilization of modern process control technology in metalforming is not its complexity, not its cost, not user unfriendliness of software, nor its suitability for the metalforming industry,” opined Michael O’Brien, president of Signature Technologies. “On the contrary, it is the inability of industry to properly understand how to digest new technology and properly train employees—training not being limited to how to use it but more importantly why to use it. Computers and consumer electronics infiltrated society in the 1990s, with North American metalformers supplying cases, disk drives and various hardware. But by the end of the decade much of this part production had moved south and overseas. Here to stay, however, are computers themselves, with the ’90s witnessing the “Internet Revolution,” dramatically increased computing power and huge software advancements. All of that meant instant communication worldwide, better machine control, nearly real-time management of metalforming operations, and the ability to quickly design stamped and fabricated parts and tooling and simulate the production process. Challenges confront the industry from all sides. How to compete? That’s what metalformers and fabricators asked themselves at the start of the new century. Customers demanded price givebacks while metalformers paid more for raw materials, energy, health care, etc., further eroding already thin profit margins. Competition from Asia, primarily China, essentially eliminated “commodity” tool and part producers in North America. And growing markets, especially in Asia, demanded that metalformers find s to stay close to customers serving those markets. On the political scene, steel tariffs in the early 2000s tightened supply and helped push prices to record levels. Lawmakers heard from metalformers concerned with Chinese currency valuation, labor, taxes and other issues stressing the industry. So where did that leave us? All of this forced the metalforming community to become leaner and meaner than ever before. Toward that end, MetalForming in the 2000s focused editorial coverage on providing methods for producing high-quality parts as quickly as possible, and delivering just what the customer wanted. That meant getting the most out of existing equipment or upgrading to get the job done; adding value within the line; employing sensors and controls so that machines and tooling worked optimally; and ensuring that shop-floor employees had the tools they needed, and the knowhow to get the most out of them. 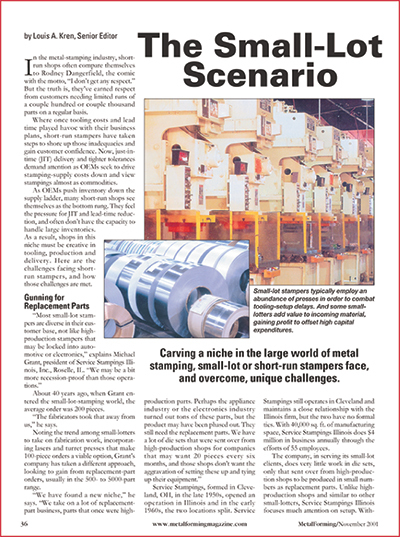 “The Small-Lot Scenario,” an article published in our November 2001 issue of MetalForming, examined the trend toward just-in-time supply of smaller part runs and how short-run specialists made that happen. “More and more companies are trying to drive stampings down to a commodity where they are looking at price,” said Jeff Newmark, president of WLS Stamping Co., Cleveland, OH. “We look to reduce our costs. One to do this is to tell people to work harder. The other is to make a change—work toward lean manufacturing and attack waste. We view the people making the parts as value-added and everything else as nonvalue-added. We won’t tell our value-added people to work harder. We will look at nonvalue-added and see how we can save there. Steel products evolved dramatically through the early part of the century (and continue to do so today), as pointed out in “Advanced High-Strength Steels for Stamped Automotive Parts,” an article MetalForming published in March 2005. “Since 2000, the global automotive industry has seen rapid improvements in automotive steels, especially with the application of advanced high-strength steels (AHSS) including dual-phase (DP) alloys and transformation-induced-plasticity (TRIP) steels,” the article read. “Predictions by major OEMs throughout the world suggest that AHSS products will replace, in large percentages, the conventional mild and HSLA steels applied throughout body and chassis structures. 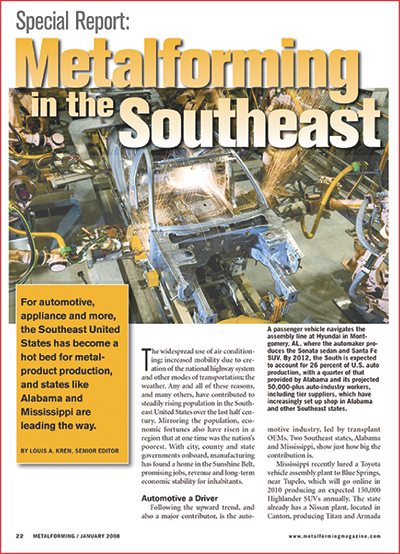 Following the upward trend, and also a major contributor, was the automotive industry, led by transplant OEMs setting up shop in Alabama, Mississippi and other nearby states. Of course, with the OEMs came their suppliers—transplant and domestic. Then the economy swooned, beginning in 2008, and in response many looked at lean manufacturing as a to reduce costs—and labor input. 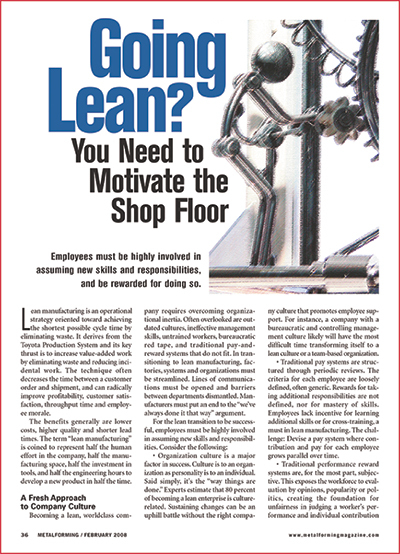 In February of 2008 we published an article on motivating the shop floor in a lean transition. What was needed was a fresh approach to company culture. Green manufacturing also surfaced to top of mind around this time, as part of a lean strategy as well as a to reduce costs. Along with the popular green strategies such as implementing more energy-efficient lighting, metalformers began to look closely at reusable packaging products. Reusable packaging, as an alternative to wooden pallets or corrugated-cardboard boxes, was seen as a to reduce waste and the nonvalue-added labor for setup and breakdown of the boxes, and to improve warehouse-space utilization as well as worker safety, since ergonomically designed containers can ease handling. Reusable packaging also can improve product flow in terms of safe and efficient transfer of parts and subassemblies to the customer. The last half of the decade also was an exciting time in the controls industry, where, in particular for hydraulic presses, we welcomed improved positioning and force control that paved the to higher part quality and productivity, and reduced maintenance costs. Adding closed-loop electro-hydraulic motion controllers with position-pressure/force-control capabilities became popular for making new hydraulic presses excel or for enabling older machines to function like new. And, retrofitting open-loop control systems with these controls provided another dimension of control to increase productivity, improve quality and decrease maintenance costs. New controls also improved the ability of metalformers to gather, track and analyze production data in real time. Metalformers began in a big to use this data-collection software to track running and idle time automatically as it polls the controllers, and also to automatically collect any unplanned downtime events initiated by the controllers. These events include tonnage and sensor faults. Stampers began to keep detailed event logs that provide a time- and date-stamped account of every event at every machine. Also, the software knows where and when every tool runs, and how many parts the tools make. Therefore, metalformers now were able to keep an accurate total-hits count for each die—even as the die runs in multiple presses—eliminating tedious and sometimes inaccurate manual recordkeeping. The unplanned-downtime information not only identifies problem equipment, but also objectively quantifies the severity of problems to allow efficient prioritizing of corrective actions. With objective information on machine utilization, metalformers now were able to justify delaying or cancelling some planned equipment purchases, while fast-tracking others. Data became king—collecting it, analyzing it and putting it in a form that metalformers could use to make informed, sound decisions about their businesses. During the mid to late part of the decade, many die shops, as well as stampers that built their own dies, began to take a close look at the rapidly advancing 3D design software. In fact, as detailed in a July 2008 MetalForming article on the move from 2D to 3D die design, we noted how the Applied Manufacturing Technology Center at Moraine Park Technical College (MPTC) ended its 2D die-design course in 2004, and replaced it with 3D design. At the time, John Cawley, tool-design instructor at MPTC, told us that 3D design software allowed him to teach students more about die design in a shorter amount of time. One reason: It automates the mundane tasks of die designing, which speeds the overall process. In addition, the process proved to be much more visual than with 2D design. Late in 2008, PMA welcomed ne Boeckman as its 2009 chairman, who at the time served as president of Quick- Stamping Inc. of Texas. Boeckman’s theme as chairman was, “Expanding Opportunities…new Ideas, Products and Markets,” and it struck a particularly harmonic chord with MetalForming magazine and PMA. It truly shone the spotlight on a key trend of the time. That was, the need for metalformers to look beyond existing core competencies and expand into new processes and customer markets. “You can’t continue to do things the same you’ve been doing them,” Boeckman said. In his company’s case, that translated into acquisition of metal-fabrication equipment such as turret punch presses, press brakes and laser-cutting machines. Boeckman’s claim that “fabrication opens new doors for us,” became one oft-repeated by metalformers over the next several years, and in fact is still commonly heard around the industry; I expect it will continue to resonate for some time. One catalyst that brought traditional stampers to the table for CNC fabricating equipment—notably turret punch presses—was the growing ability of these machines to perform forming operations, in addition to making holes and nibbling contours. This ability, due primarily to tooling innovation, allowed stampers to develop prototype parts on a turret press, then decide, based on production volumes, whether it made sense to tool up a stamping press to enter production of a new part, or to just soft-tool a turret press to satisfy relatively low-volume production runs. Flexibility—in every sense of the term—became the mantra, and still is. Meanwhile, on the stamping front—particularly the automotive-stamping front—we continued to experience rapid advancement in advanced high-strength steels. This trend helped to usher in a new era of metalforming-technology advancements. Thanks to lightweighting initiatives, steelmakers poured even more research and development resources into devising new steel grades with tensile strengths as much as three times greater than traditional mild steels, but also with significantly less formability. Forming AHSS grades in high volumes for the automotive industry now challenged the metalforming industry to develop new cleaner and more homogeneous tool steels, as well as beef-up presses and feed equipment. 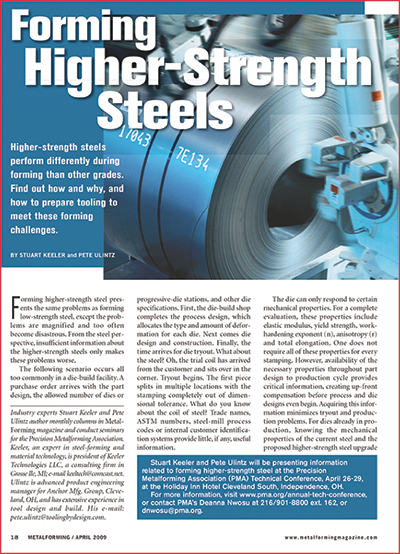 “The increased forces needed to form, pierce and trim higher-strength steels creates significant problems for pressroom equipment and tooling, including excessive tooling defections, damaging tipping moments, and amplified vibrations and snapthrough forces that can shock and break dies—and sometimes presses. Stamping higher-strength steels can affect the size, strength, power and overall configuration of every major piece of the press line, including coil-handling equipment, coil-feed systems, straightening machines and presses. And that’s where we’ve been for the last few years. We’ve seen an onslaught of productivity gainers hit our production floors, from software-based tools for paperless die design and development, to automation equipment that keeps presses, lasers and other processes humming after hours. We’re bringing in new high-powered ERP software platforms that are setting new standards for the flow of information through our plants, with capabilities like integrated quality, capacity and inventory management. We’re welcoming a completely new type of machines into our factories, such as servo-mechanical stamping presses and hot-stamping lines, next-generation hybrid and electric press brakes and turret presses and fast-cutting and efficient fiber lasers. New programming software for these machines improves usability and accuracy, even featuring 3D simulation and modeling to simplify programming and operation. Press controls have continued to evolve, pushing press uptimes higher than ever before, while bringing PPM levels to all-time lows. Changeover times have dwindled, machinery throughput has skyrocketed and overall costs related to safety and quality continue to shrink. All of this adds up to the unthinkable just a few years ago—that is, reshoring of work moved to China and other “low-cost countries” back to the United States. Our plants are leaner, greener and cleaner than ever before. We’re experts in optimizing measures like value-add per employee and inventory turns. See also: Signature Technologies, Inc.